Our “Timothy in color” theme this week continues with another look at his first verifiable film role (the jury is still out regarding his supposed appearance in Billy Wilder‘s Ace in the Hole, aka The Big Carnival), that of a corpse in William Wellman‘s Across the Wide Missouri (1951). Even though Wellman undoubtedly could have gotten anyone for the part, nobody could lay in freezing cold water with two arrows in his back like Tim. 12/01/15 EDIT: Another one bites the dust. Sorry about that! This week’s video provides a look – a really quick look – at Timothy’s first official film appearance. It’s Across the Wide Missouri (1951), directed by William Wellman. Fast-forward to 35:06 and you’ll see Tim’s grand film debut – as a corpse. But like I say, don’t blink or you’ll miss it! Tim spoke several times in interviews about his escapades during the making of the film in Durango, Colorado, involving director Wellman and the film’s star, Clark Gable. This was also silent Western star Jack Holt‘s final film. Enjoy! 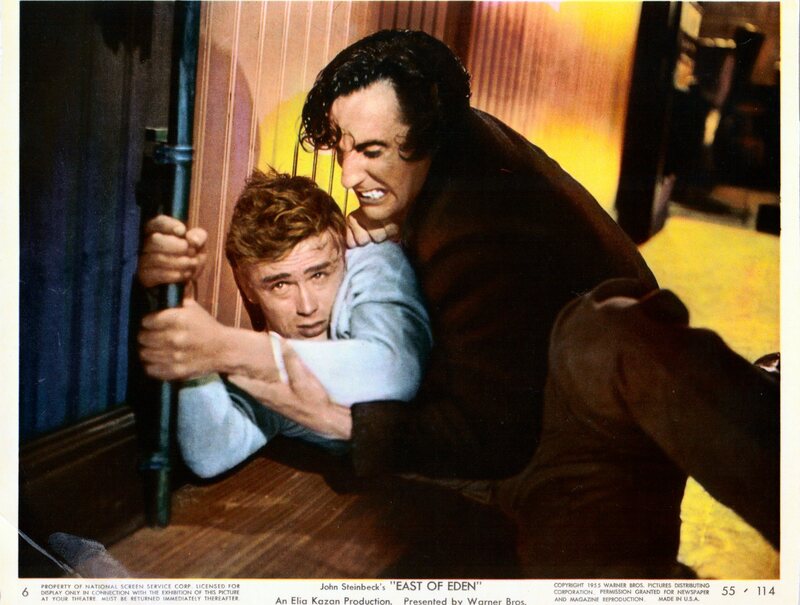 We are indebted to 50 Westerns From the 50s blogger Toby Roan (and his wife!) for this week’s quote. This is the earliest newspaper tidbit about Timothy that I’ve seen to date. Timothy Carey of Brooklyn followed Horace Greeley‘s advice, went West and landed a screen role with Clark Gable in Across the Wide Missouri. The lanky young Brookridge High School alumnus, following several seasons playing pro baseball, found himself in Colorado. He heard that Metro-Goldwyn-Mayer was about to film the outdoor saga near Durango. With summer stock experience in the east to his credit, Carey set up housekeeping at an abandoned cabin near the studio location. He finally met Director William Wellman, who gave him the role of French Dunord, Gable’s trapper friend. Not being a member of the regular Hollywood group, Carey has the distinction of being the only screen actor to share a cabin with several chipmunks. Whether looming over the strangely invertebrate James Dean as the muscle of the local brothel in East of Eden or buying the farm in a whisker-quick saloon shoot-out with Marlon Brando in One-Eyed Jacks, the disheveled, vertiginous Timothy Carey performed, through much of his career, as the kind of thespian rarity whose flickering presence, even when bereft of a fleshed-out “character,” struck a loud, long-resonating note in the frequently seam-riddled “seamless narratives” it embellished. Like a portal into a reality hidden from view by scopophobic hysteria, Carey materialized from an alternate universe devoid of heroes and legible story lines. Only the sharpest and restive of “great” directors, and the most cynically astute hacks, recognized Carey’s innate ability to enlarge a piece of cinema into something beyond cinema. Anecdotal evidence reflects how often even those who perceived Carey’s ungovernable grandeur were either prevented from casting him, or themselves provoked by his antics into tossing him out of a picture. He was, in effect, too much of what he was, too formidably present to evaporate into a peripheral presence; both his imposing physicality and his avid wish to smuggle something living into something simulated got him scotched from films like Bonnie and Clyde and The Grifters; the insecurity of Harvey Keitel purportedly scrapped a major role in Reservoir Dogs; Carey, by his own account, sabotaged his own way out of The Godfather and Godfather II. Our pics this week are going to have something of a theme – Timothy’s death scenes. He gave his all in his death scenes. He once quoted Marlon Brando as telling him, “Tim, you’re the only actor that I ever worked with that even in death, you move.” His first official screen appearance was that of a corpse, in William A. Wellman‘s Across the Wide Missouri (1951). He is uncredited as the late French fur trapper Baptiste DuNord, killed by Indians. It says “revisited,” but it’s the same pic I posted over a year ago. That’s because this is it! This is only shot of Timothy in his grand film debut in William Wellman‘s Across the Wide Missouri (1951). He appears as the corpse of fur trapper Baptiste DuNord. Yes, that’s right – the corpse.